When I was six years old I once saw a magnificent picture in a book about the virgin forest called "Stories Lived." It was of a boa constrictor swallowing a wildcat. Here’s a copy of the drawing. 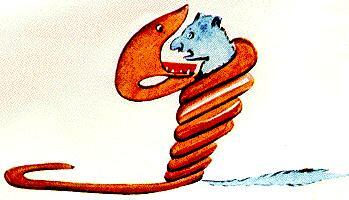 In the book it said, "Boa constrictors swallow their prey whole, without chewing it. Then they can’t move and they sleep for the six months it takes to digest." I showed my masterpiece to adults and asked them if my drawing scared them. They answered, "Why would a hat scare anyone?" Les grandes personnes m’ont conseillé de laisser de côté les dessins de serpents boas ouverts ou fermés, et de m’intéresser plutôt à la géographie, à l’histoire, au calcul et à la grammaire. C’est ainsi que j’ai abandonné, à l’âge de six ans, une magnifique carrière de peinture. J’avais été découragé par l’insuccès de mon dessin numéro 1 et de mon dessin numéro 2. Les grandes personnes ne comprennent jamais rien toutes seules, et c’est fatigant, pour les enfants, de toujours leur donner des explications. The adults advised me to leave aside drawings of open or closed boa constrictors, and to take an interest in geography, history, math, and grammar instead. That’s how, at the age of six, I abandoned a magnificent painting career. I’d been discouraged by the failure of my drawing number 1 and my drawing number 2. Adults never understand anything on their own, and it’s tiring for kids to always be explaining things to them. J’ai donc dû choisir un autre métier et j’ai appris à piloter des avions. J’ai volé un peu partout dans le monde. Et la géographie, c’est exact, m’a beaucoup servi. Je savais reconnaître, du premier coup d’œil, la Chine de l’Arizona. C’est utile, si l’on est égaré pendant la nuit. So I had to choose another profession and I learned how to pilot planes. I flew just about everywhere in the world. And geography, that’s right, served me well. At first glance, I could tell China from Arizona. That’s useful, if you’re lost at night. Thus, over the course of my life, I had a lot of contact with a lot of serious people. I often lived in adults’ homes. I saw them very close up. It didn’t do much to improve my opinion of them. Quand j’en rencontrais une qui me paraissait un peu lucide, je faisais l’expérience sur elle de mon dessin no.1 que j’ai toujours conservé. Je voulais savoir si elle était vraiment compréhensive. Mais toujours elle me répondait : « C’est un chapeau ». Alors je ne lui parlais ni de serpents boas, ni de forêts vierges, ni d’étoiles. Je me mettais à sa portée. Je lui parlais de bridge, de golf, de politique et de cravates. Et la grande personne était bien contente de connaître un homme aussi raisonnable. When I would meet one who seemed fairly perceptive, I would give them a taste of my drawing number 1 that I’d always kept. I wanted to know if they were really understanding. But they would always reply, "It’s a hat." So I wouldn’t talk to them about boa constrictors, or virgin forests, or stars. I’d relate on their level, talking to them about bridge, golf, politics, and ties. And the adult was very happy to know such a reasonable man. Salut! Merci bien pour le site! Formidable! 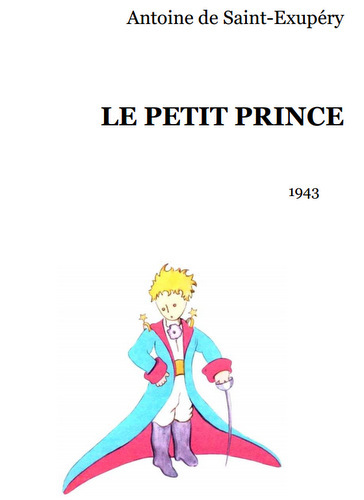 I am looking at your page that has the first chapter of Le Petit Prince. You have the sections translated, then at the bottom, you have a PDF of the book. Do you have translations of any of the other chapters and grammar lessons like you do with the first chapter? This would be hugely helpful, especially since this is my first time teaching the book. Merci bien, I’m glad you like it! No, I’ve only translated the one chapter. I’m sure you can find a translation online somewhere else though – bon courage !